Hello and Happy Hump Day! Hope your week has been going great! I'm still working on my Christmas Cards.. ugh! Why oh why do I wait until the last minute. Since I have a Design Team Card for Paper Craft Crew today, I killed two birds with one stone and made a Christmas Card for one of my sweet granddaughters! Check out the fun sketch!!! And here's what I made using a some awesome products I received from Gina K Designs! This little santa from Gina K Designs "Christmas Magic" set is so adorable! I love that it has coordinating dies. I bought a fabulous Christmas card kit from Gina K Designs that included this stamp set as well as others, cardstock, dies and even this fun DSP. It was an awesome value and has been well used for my cards this year! For the adorable Santa, after coloring with copics, I added some Dazzling Diamonds Glitter with a Quickie Glue Pen on the edge of his coat, hat and gloves. All of my sweet granddaughters love anything glittery so this will be a winner! I hope you love it as much as I do! Now go make a card based on this awesome sketch and link it up! Tina, I had to come over and see who made these products, oh that Santa is so cute! Love the layout too, that paper is gorgeous! Thanks so much AJ! You are such a sweetheart. Yep, it's a Gina K Designs set and I love it! Thanks for stopping by! 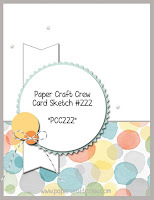 PCC223 Paper Craft Crew Sketch Challenge! SIP #78 Winter Holiday Card! SIP Challenge #77 - Sketch Challenge!